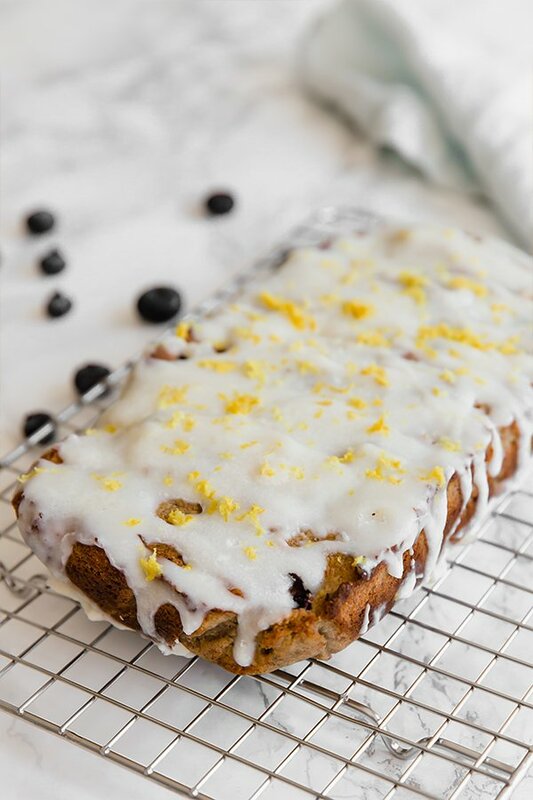 This paleo lemon blueberry banana bread is the perfect springtime treat! It’s paleo, gluten-free, and AIP compliant. Lemon and blueberry are one of my favorite flavor combinations! It’s light, refreshing and tastes good in so many different recipes. Whenever springtime rolls around I’m already thinking about what lemon blueberry treats I’m going to make. 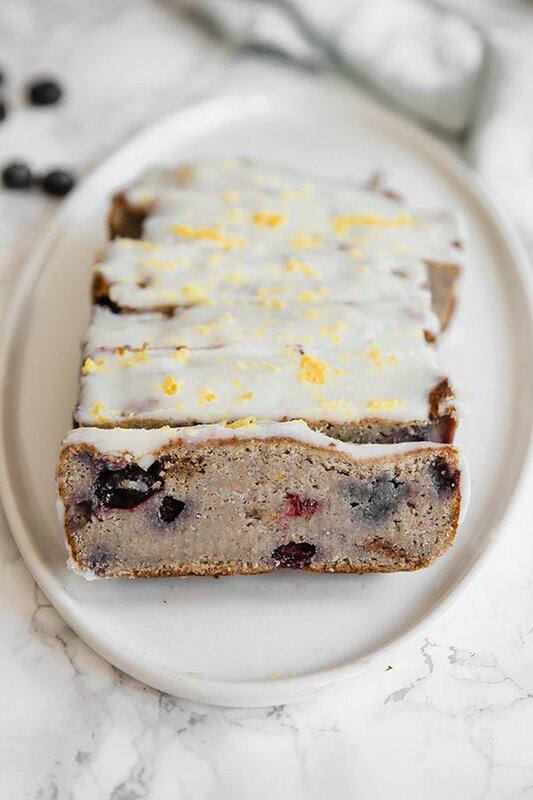 This year, I wanted to marry some favorites all in one with this paleo lemon blueberry banana bread! 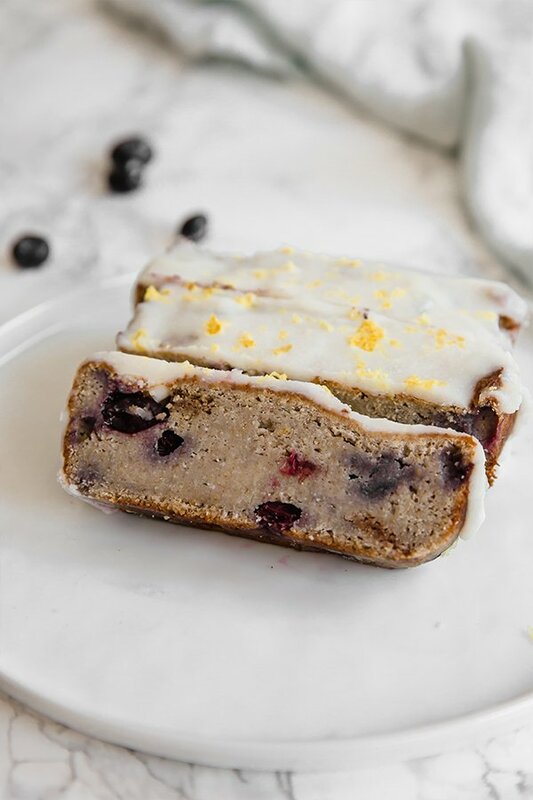 Banana bread is always welcome in my book, and adding the lemon blueberry flavors to the bread just takes it to the next level. 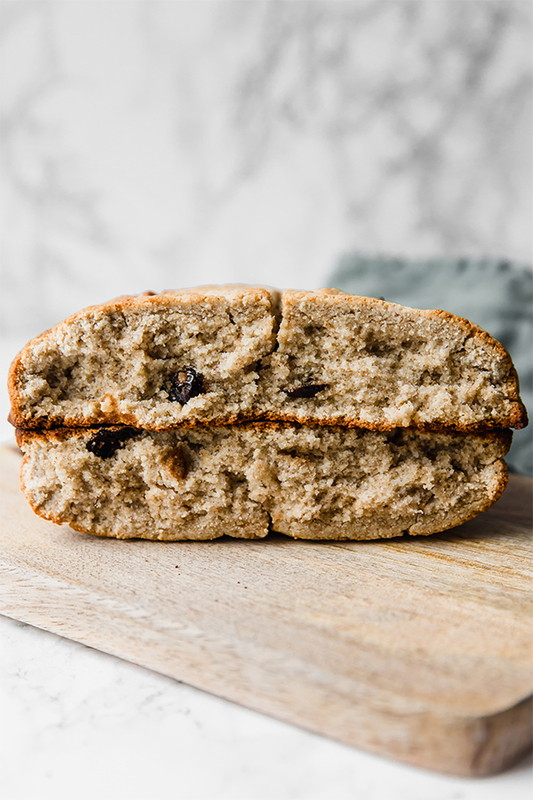 Not only is this bread grain free, gluten free, and AIP, it also happens to be egg free and vegan! It’s a great treat to bring along to a springtime gathering to share with friends and family who follow all different types of diets! Oh, and it’s nut free too as an added bonus. Ripe bananas are what you’ll need for this bread, but plantain is a secret ingredient! Plantain is the starchier cousin to banana, and through they’re similar, they can’t be swapped 1:1 in this bread. Since this bread is missing gluten, grains, and eggs, the plantain really helps give it more of a structure. I haven’t tried making this bread without plantain, but if you choose to do so, you may need an egg substitute to add more structure. Tigernut is not a nut, but a tuber. You may be able to use cassava for this recipe (though I haven’t tried it), and if you can likely use almond flour if you tolerate nuts. Coconut flour is harder to swap as its purpose in this recipe is to absorb any excess moisture from the banana. Coconut oil is the fat source for this bread. Can’t do it without fresh blueberries! You’ll use both lemon juice and fresh lemon zest for the glaze of the bread to give it that fresh lemon flavor. Preheat the oven to 400 F and line a loaf pan with parchment paper lightly greased with coconut oil. Using a blender, blend the yellow plantain and bananas until fully mashed. Set aside. Combine the tigernut flour, coconut flour, baking soda, and coconut sugar and mix. Fold in the plantain and banana mixture, coconut oil, and lemon zest to form a dough. Carefully mix in the blueberries, being careful not to pop them. Pour the batter into the prepared loaf pan and bake in the preheated oven for 35-40 minutes or until a toothpick can be inserted and comes out clean. For the glaze, combine the melted coconut butter, oil, honey, and lemon juice and stir to combine. Pour over the bread and top with lemon zest. Allow to harden in the fridge for 5-10 minutes before slicing and serving. The best method to melt coconut butter is a double boiler method to avoid burning. 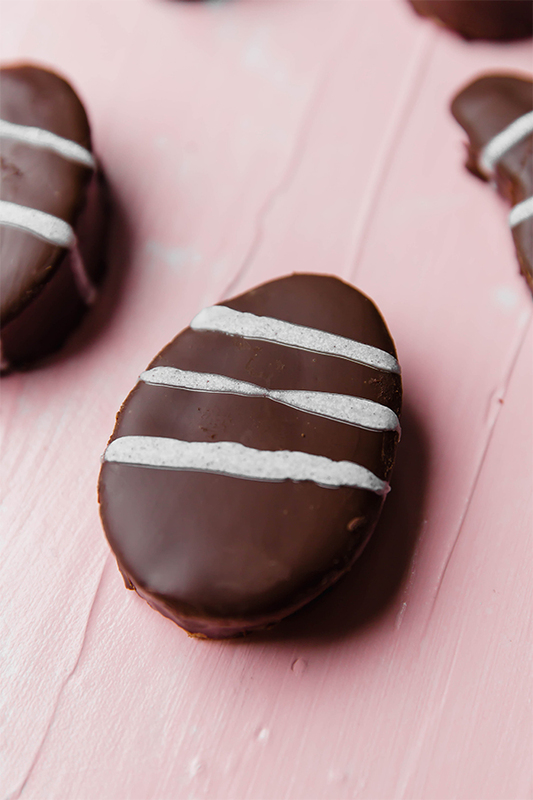 These marshmallow Easter eggs are a real food version of classic Easter candy. They’re fun to make at home, nut free, paleo, and AIP compliant. There’s always a natural lull with treats between Valentine’s day and Easter. We’re all just trying to get through the winter, and that usually means lots of soups, and maybe some comfort foods, but we’re not necessarily diving into the candy aisle at the drug store quite as often. I know all about diving into the candy aisle at Walgreens… it was my favorite pastime in my teens, and Easter was one of my favorite times to do it. Cadbury eggs, chocolate bunnies, Reese’s peanut butter eggs, and marshmallow eggs! We all get nostalgic around the holidays, so I wanted to recreate a classic that’s fun to make, and even more fun to eat… marshmallow eggs! They’re made with homemade marshmallows, a chocolate coating, and you can get as creative as you want to decorate them as a fun craft. These marshmallows are made without any cornstarch or weird ingredients. 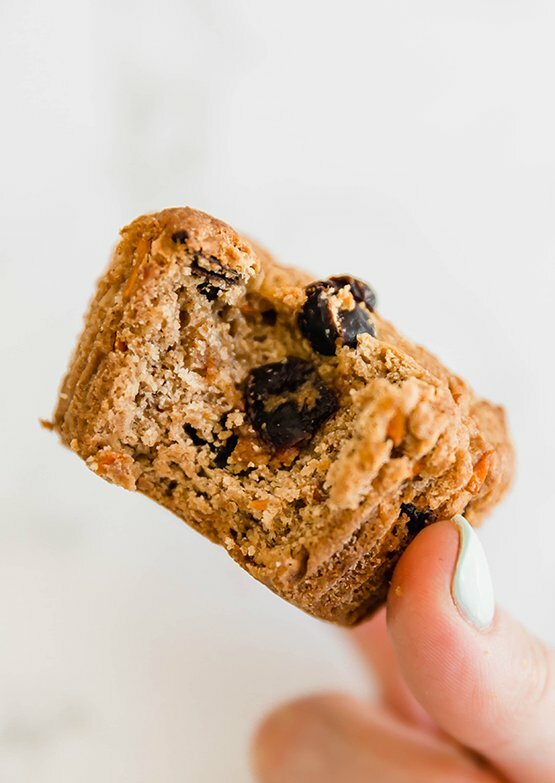 This treat is nut free, paleo, and AIP friendly. This is seriously all you need to make marshmallows! Well, the arrowroot starch is only to make things easier to cut so even that isn’t super necessary. All you need is minimal ingredients, like Gelatin (which is different than collagen) and honey. To make marshmallows, you need a full cup of honey. You can’t scale back the amount in the recipe, but you can moderate your sugar intake by choosing to use fewer marshmallows. Though gelatin and collagen are made from the same source and have similar benefits, they cannot be swapped for each other. The marshmallows need gelatin for a jiggly texture. You can use dairy and soy free chocolate chips, or you can use my recipe for Hannukah Gelt and just use a different mold and chop it into carob chunks! This is an optional step if you’d like to decorate your eggs. They taste just as yummy by themselves! You can use cookie cutters shaped like anything you’d like! I used both eggs and bunnies. The eggs are easier to coat, but you can get creative as you want to make it fun. Prepare a large casserole dish pan by lining with parchment paper and coating with arrowroot starch. Slowly add in the honey mixture into gelatin mixture as you whisking with either with an electric hand mixer or in a stand mixer. Continue whisking for 10-12 minutes. The marshmallow mixture should be lukewarm, thick, and marshmallow peaks should start to form. Use an egg-shaped (or bunny, carrot, etc.) cookie cutter coated with arrowroot slice marshmallows. Store in the fridge. Use a double boiler method to melt the chocolate with the coconut oil until fully liquid. 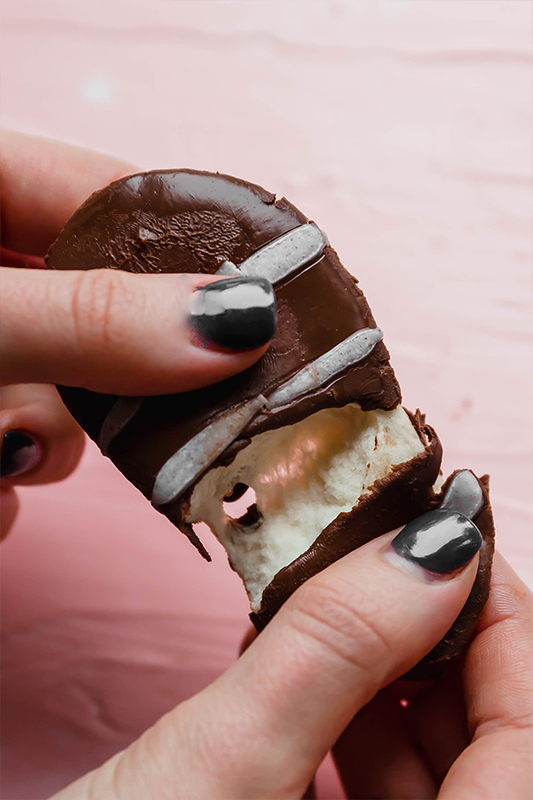 Use a fork to dip the marshmallows one by one into the chocolate until fully coated. Place on parchment paper and chill in the fridge. Prepare the colored coating by combining the coconut butter with the coloring of your choice. 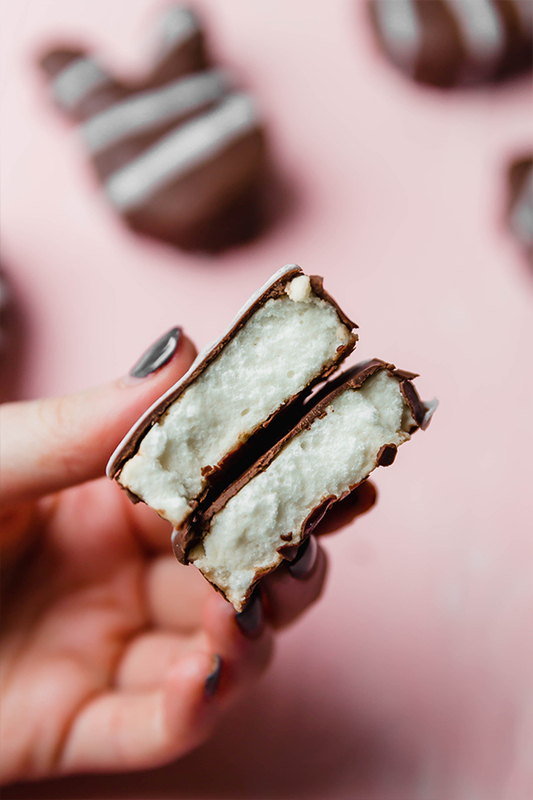 Drizzle the coconut butter over the hardened chocolate marshmallows. Return to the fridge to harden. These carrot cake muffins are simply the best! They’re paleo, AIP, and made without grains, nuts or eggs. I never really got to enjoy carrot cake as much as I would have liked to because it almost always had nuts in it! Though I haven’t been full paleo my whole life, I’ve spent my whole life with an allergy to all nuts (with the exception of almonds) so carrot cake was off the table. It’s always a bummer when something is off limits, so I decided to create a carrot cake muffin that was allergy friendly! 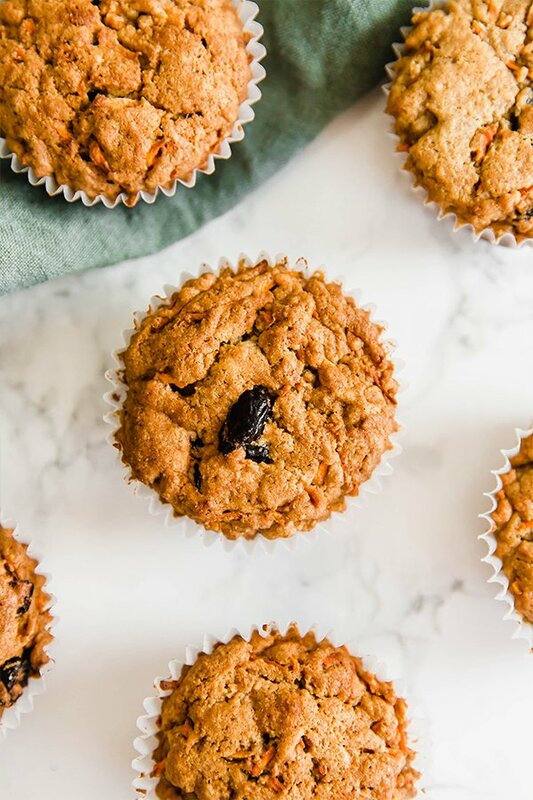 These carrot cake muffins are seriously perfect for sharing! They’re made without common allergens like dairy, gluten, and nuts, and they taste amazing. Make them for an Easter brunch, an after dinner treat, or just a simple snack. 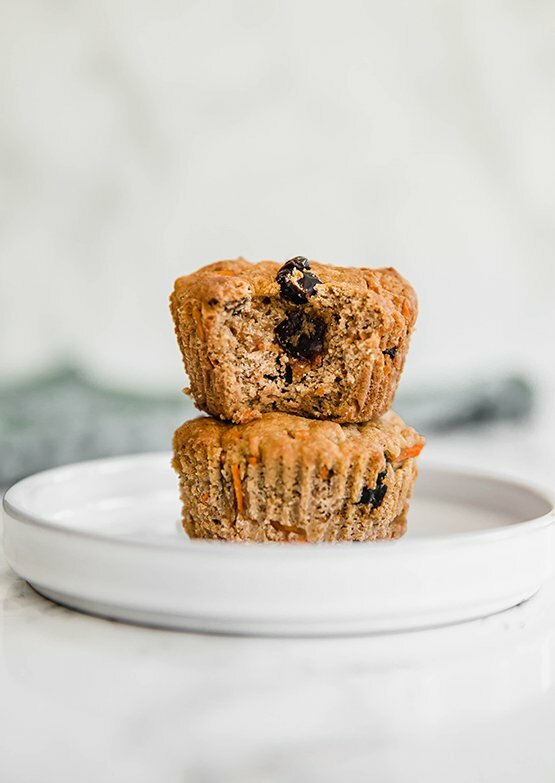 Muffins that are made without things like grains and eggs can be pretty hard to pull off, and don’t necessarily have the best texture. Not these! The trick is to let them cool completely before trying them to allow them to set and keep them from getting too soft. Leave them on a cooling rack on the counter for about 30 minutes, or even better, throw them in the fridge for a bit as well, and you’ll have a great texture! Tigernut is not a nut, but a tuber, and it helps to make a great texture for these muffins. If you do tolerate nuts, almond flour may be a good swap, but cassava flour would not be a good substitute in this recipe. You can likely get away with swapping this for arrowroot starch. The coconut flour helps to absorb some of the excess moisture from that the carrots may produce. I have not tried this recipe without coconut flour. The coconut oil is the source of fat in the muffins where they would usually be something like butter. I have not tried palm shortening in this recipe, but it may work. You can likely swap honey for maple syrup. You can either use a grater or a food processor to have mostly finely shredded carrots. Golden raisins are what you would usually add to carrot cake, but if you’re having trouble finding any raisins without weird oils or sugars, I like to use these cranberries. I use grass-fed gelatin to make two gelatin eggs to make this recipe egg free. However, you can use regular eggs if you tolerate them. Preheat the oven to 375 F and line a 12 cup muffin tin with 8-9 muffin liners. Combine the tigernut flour, tapioca starch, coconut flour, shredded carrots, raisins, baking soda, and cinnamon and mix well. Stir in the maple syrup and melted coconut oil. Mix in the eggs (or gelatin eggs) and stir well until a dough forms. Spoon the muffin dough into the muffin tins (you’ll have about 8-9 muffins). Bake in the preheated oven for 20-25 minutes or until baked through and the tops are golden brown. Carefully transfer the muffins to a cooling rack and allow to cool completely before enjoying. Cooling in the fridge also helps the muffins set further. For the gelatin egg substitute – Add 1/2 cup water to a small sauce pot and slowly sprinkle in 2 tbsp of gelatin. Use a fork to gently mix in any clumps. Set aside and allow the mixture to harden for 2-3 minutes. Place the pot on the stove and turn the heat on low heat. Slowly melt the gelatin over 1-2 minutes. Immediately remove from heat once the gelatin has melted and the mixture has returned to liquid. Vigorously whisk the liquid until it becomes frothy. Pour it into the breadstick mixture immediately to swap for an egg. 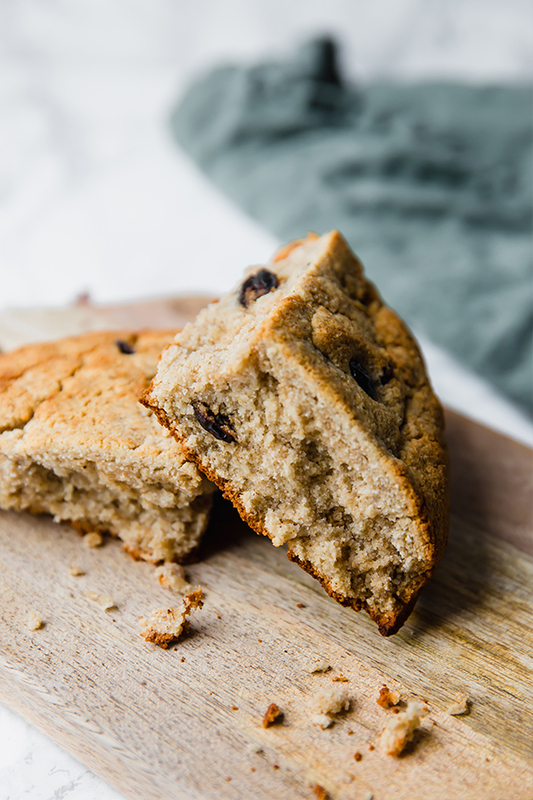 This paleo Irish Soda bread is perfect for St. Patricks Day! It’s made without grains, dairy, nuts, and can also be made egg free. I’m not Irish myself, but I grew up on Long Island where St. Patricks Day was always a huge celebration! I loved going to the parade every year and looked forward to everything that St. Patricks Day had to offer. The bagel shop near my house would literally serve green bagels for the holiday, and my family was all about it. I had plenty of those, but I never had Irish Soda bread! I was seriously missing out. 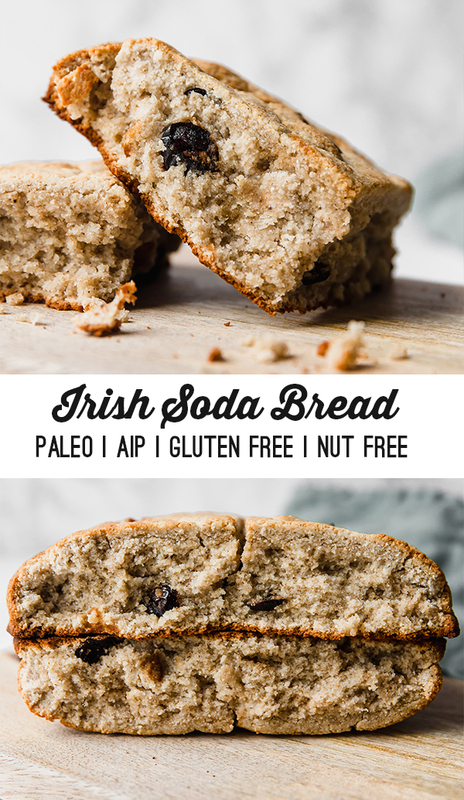 I did a lot of research about what goes in a traditional Irish Soda Bread, and decided to make it paleo & AIP! It feels like a serious treat to bake a big loaf of bread that’s AIP friendly. While it feels more like a dessert than a loaf of sandwich bread, I’m not complaining. I found this made a nice soft of crumbly and crispy texture for the bread. I have not tried other flours like cassava, but tapioca can likely be used in place of arrowroot. The coconut flour helps absorb the moisture from the milk, so I wouldn’t swap that out. Traditionally, this recipe has buttermilk, so this creates that same flavor! I find palm shortening makes a better cakey texture than coconut oil in recipes like this. I haven’t tried to swap it out in this recipe. This recipe is made with a gelatin egg to make it AIP and egg free, but a regular egg would work too. Mix the coconut milk with the apple cider vinegar and set aside. Cut in the palm shortening and combine well. Mix in the honey and coconut milk mixture and stir well to start to form a dough. Mix in the egg, or prepare the gelatin egg and mix in the gelatin egg. See notes. 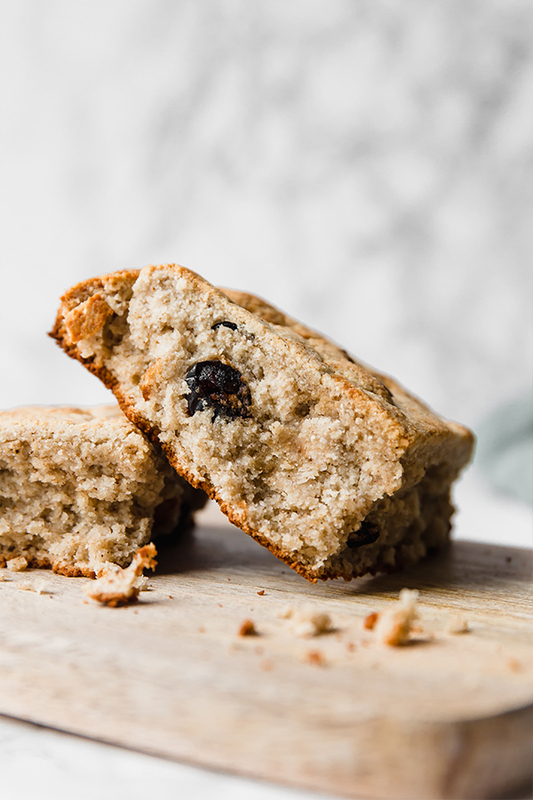 Fold in the raisins until evenly incorporated in the dough. Place the dough onto the baking sheet and form into a round loaf. Use a knife to score a cross shape in the bread. Bake in the preheated oven for 23-25 minutes or until the dough turns a light golden brown. These Samoa cookies are made with all real ingredients! 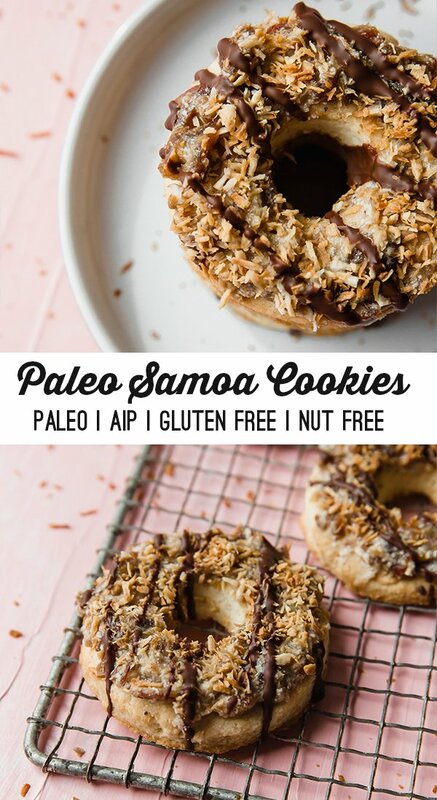 They have a coconut topping, a date caramel, a grain free cookie base, and are paleo and AIP. 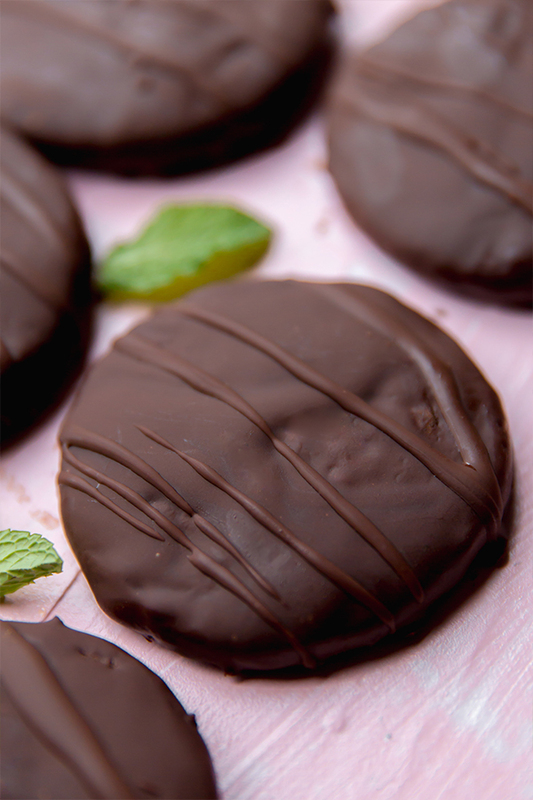 Last week, I shared my own personal favorite girl scout cookie recipe for Thin Mints! When I asked some of my readers on Instagram what their favorite girl scout cookie was, Samoas were a clear winner. 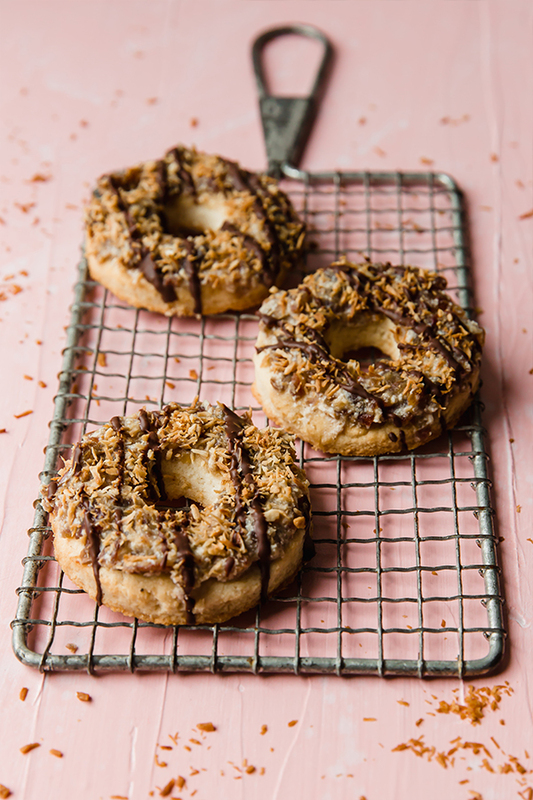 Luckily, I had already made my own version of Samoas that I was just waiting to share! 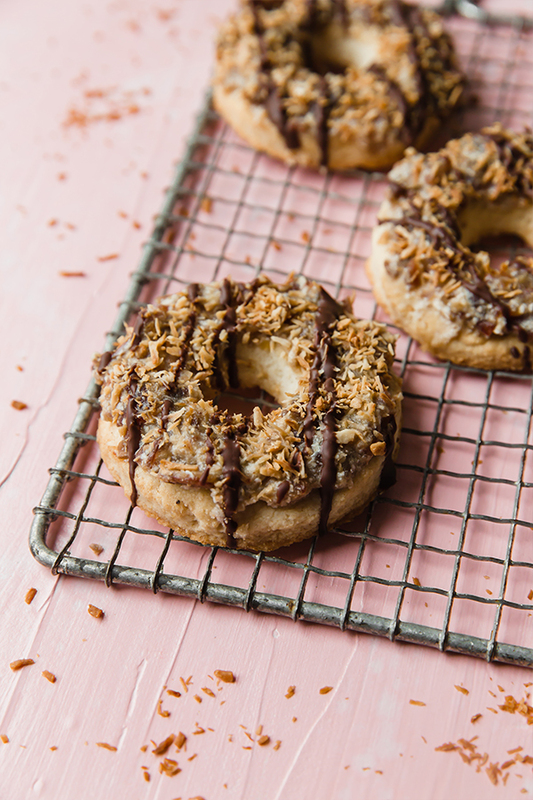 Samoas are coconut caramel cookies that have a shortbread base and are coated in chocolate. So basically, they’re pretty perfect. 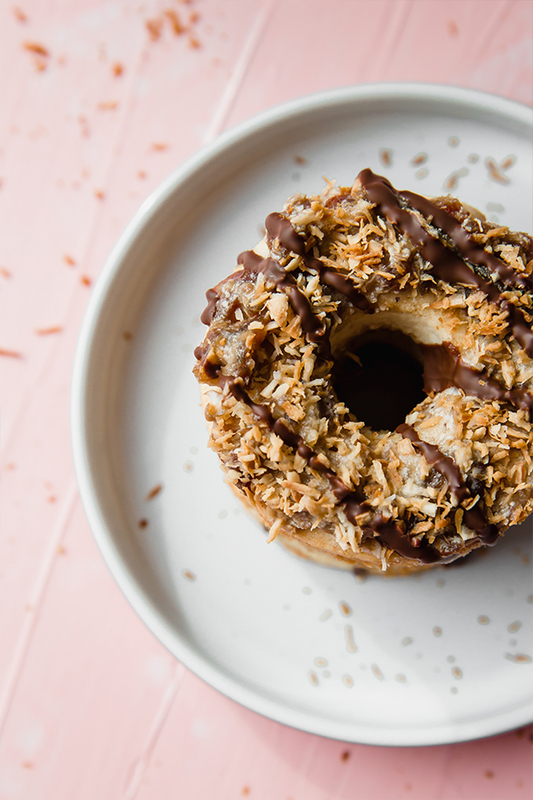 This paleo and AIP version of Samoas is made with a coconut flour shortbread cookie base, then topped with a coconut and date caramel topping, toasted coconut flakes, and finished with a drizzle of chocolate. They look just like the real thing, and taste like it too! These are for the shortbread cookie base. They’re fairly easy cookies to make, and definitely, taste like shortbread. What I like about them is that they’re a bit cakier than traditional Samoas! This makes the date caramel that tops the cookies. Make sure that you get big, juice medjool dates if possible! They really have the most flavor and the best sticky texture. You can easily make your own toasted coconut at home with shredded coconut that’s toasted in the oven at low heat. I got this great cookie cutter set on Amazon that has all of the sizes to needed to make these cookies and more! I used about a 3″ cookie cutter to make the cookie, and the smallest cookie cutter to make the center. You can use other tools to make the smaller hole in the center, but a very small cookie cutter will produce the most uniform and clean result. Preheat the oven to 325 F and line a sheet pan with parchment paper lightly greased with coconut oil. Take a small handful of dough and lightly flatten onto the parchment paper. Use a 3″ cookie cutter to form a cookie, and use your fingers to pull away any excess dough outside the cookie cutter. Use a small 1″ cookie cutter to cut a hole in the center of the cookies and set aside the excess dough. Repeat the process for all of the dough until you have 7-8 cookies or so. Use a fork to make 4 small punctures around the surface of the cookies. Bake in the preheated oven for 10-12 minutes. Allow cooling slightly before very carefully transferring the parchment paper to a cooling rack. Allow the cookies to cool completely before touching them, or they will break easily. While the oven is still at 325 F, add the shredded coconut to a baking sheet lined with parchment. Bake in the preheated oven for 5-7 minutes or until lightly toasted. Set aside. Add the pitted dates to a food processor and pulse until chopped. Add the coconut milk and pulse to combine. Set aside. Melt the chocolate using your preferred method (I prefer a double boiler method) and set aside. Assemble the cookies by adding about 2 tbsp of the date mixture to one cookie, then topping with shredded coconut, and finally a thin drizzle of melted chocolate. Repeat the process for all of the cookies. Place in the fridge for chill for about 20-30 minutes to allow the toppings to set. 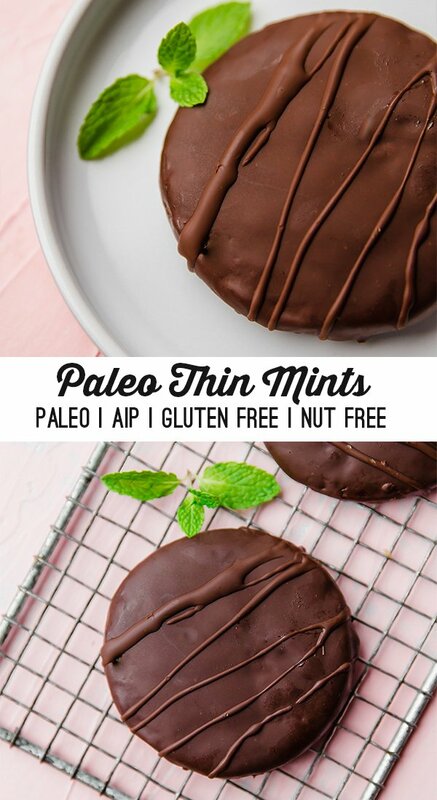 These paleo thin mint cookies are the real deal! They’re the perfect treat to take you on a walk down memory lane while still being gluten free, grain free, and AIP. Girl Scout Cookie season is awesome! There’s something about only being able to get them for a limited time combined with the fact that they’re actually delicious that makes us all fall in love. I was a girl scout, and I sold quite a bit of cookies in my day… the most in my town one year actually 😉 My mom (who was one of the troop leaders) told our troop that we had sold enough cookies to go on a camping trip and I raised my hand and asked if we could go camping in a hotel. That’s one of her favorite stories. But back to cookies… Thin Mints were always my favorite! They’re crispy without being too hard, super chocolatey, and have a subtle minty flavor that doesn’t overpower things. So when I realized I didn’t have any Girl Scout cookie dupes on my blog yet, I knew that’s where I had to start! 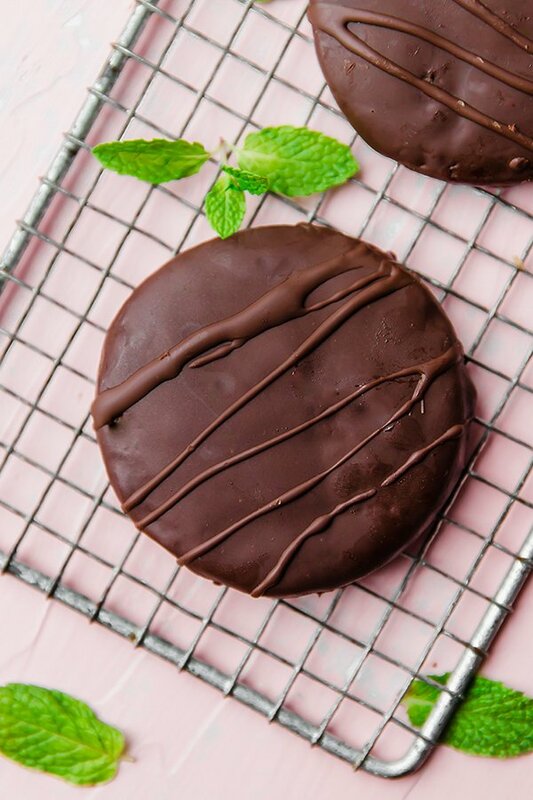 These Thin Mint cookies are paleo, dairy free, soy free, gluten and grain free, and easy to make AIP! Tigernut is a tuber, not a nut, so these are still nut free! I have not tried another flour. You can likely swap this for tapioca starch. You can use any cocoa powder, or swap carob for AIP. You’ll use dry gelatin powder to help bind the cookies. You cannot sub collagen in this recipe. I have not tried to make these coconut free, but you can try palm shortening as a swap. You can likely use honey as well. Peppermint extract usually has added ingredients, so if you’re AIP you’ll want to use a food grade peppermint oil. Peppermint oil is a bit stronger, so be careful of the strong scent when you open it the bottle! Preheat the oven to 375 F and line a baking sheet with parchment paper lightly greased with coconut oil. Combine the dry ingredients in a mixing bowl and mix well. Fold in the wet ingredients and mix very well until fully incorporated and dough forms. Take a small handful of dough at a time and slightly flatten it onto the parchment. Use a 2.5″-3″ round cookie cutter to cut the cookies, using your fingers to pull away any excess dough from the sides. Repeat with all of the dough. Bake in the preheated oven for 11-12 minutes. Very carefully transfer the parchment paper to a cooling rack. These cookies need time to set or they will break. Allow to cool and set before coating. Bring a pot of water to a low boil and place a metal bowl over the top of the pot. Add the ingredients for the coating to the pot and stir until fully melted and incorporated. Carefully set the bowl to the side. 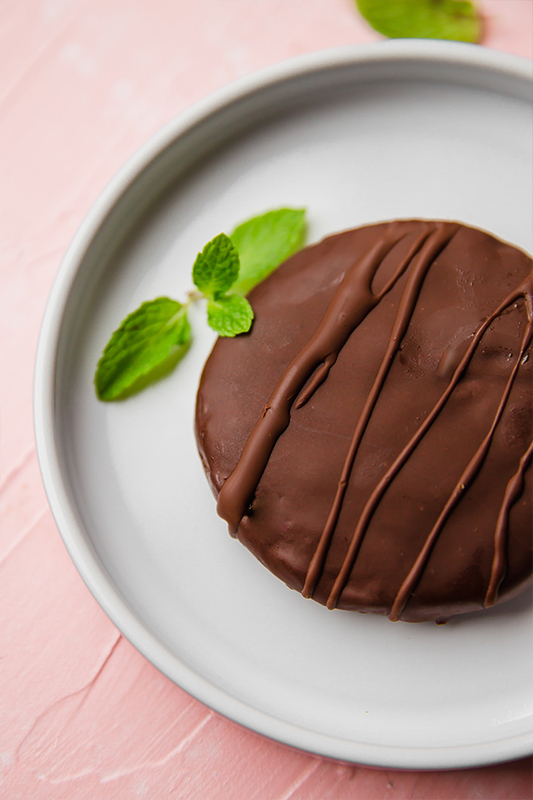 Use a fork to dip one cookie at a time into the chocolate and evenly coat, allowing excess chocolate to drip off. Set aside on a cooling rack or parchment paper to harden in the fridge for 30 minutes or in the freezer for about 15 minutes. Optional- After the first coating of chocolate has hardened, use any remaining chocolate to drizzle over the tops of the cookies. Chill again to harden before enjoying.